Let’s face it: Most people couldn’t (or wouldn’t) go a day without their phones. The handheld devices connect us to our loved ones, keep us informed about the daily grind, and provide entertainment when we need some virtual alone time. With all these benefits, it’s easy to overlook how well smartphones do at streamlining everyday activities into manageable parts. Productivity apps can help you consolidate important information into sensible lists, archive multimedia content into folders for later viewing and automate routine tasks such as turning on the porch light at sunset or updating your profile status across social media channels. No matter how simple or intuitive an app is, there’s going to be a learning curve for users. “We have discovered that anyone who is not somewhat flexible in modifying their approach or way of working to fit the app will always be frustrated,” notes Jeff Kear, creator of Planning Pod, an online event planning application. To minimize the learning curve and find apps that produce effective results, stick to apps that store information in a centralized place and present it in a digestible format. Apps should sync across devices so you can access your content wherever you are. This will encourage you to make the apps part of your daily routine and get you well on your way to managing your time more wisely. Try these 23 free apps that will increase your productivity and help make your life easier. Automate saves you time completing everyday tasks on your phone by handling the grunt work for you. Edit a flowchart and add blocks and connections to create your automated tasks. 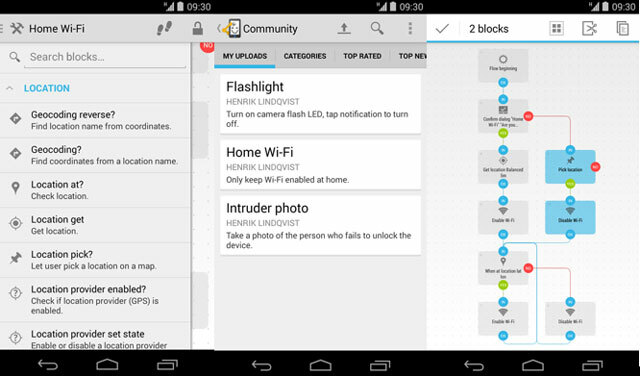 Build on more than 300 blocks, including microphone volume adjustment, composing email, checking the weather and more. Create a series of blocks that turn on your phone’s Wi-Fi when you’re at home but switches to LTE when you leave work. Use your connected blocks to track would-be thieves and automatically take a selfie whenever the user enters the wrong passcode on your device. 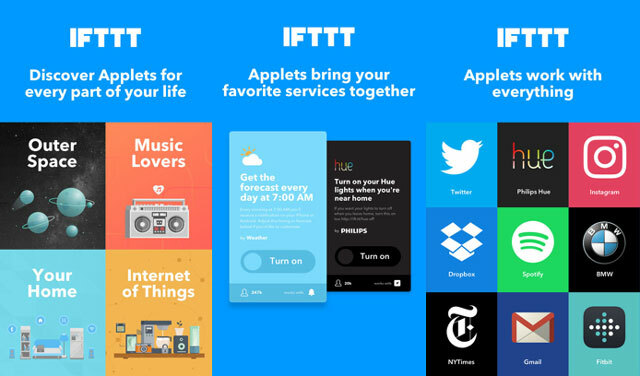 IFTTT is today’s go-to task automation service. More than 400 services can be integrated with IFTTT applets (task automations) to automate even the most routine tasks. Among hundreds of applets to explore are 18 applets for the news, 21 applets for the weather, and 12 applets for book lovers. The two-step process uses the idea that “IF This happens, Then perform That.” Create a notification to text you a reminder if you need an umbrella that day, use geolocation to track your work hours in your calendar app, or even get an alert from ESPN with your team’s final score during date night. Workflow uses a series of actions as building blocks to create task automations. The actions represent single steps to get you to a desired result within each workflow. Running late for a meeting? Create a series of actions to search for events, check travel times, and message meeting participants about how delayed you’ll be. Need to create a hands-free note? Set up another workflow to create a voice memo, save it to your Dropbox, and add that file link to reminders so you don’t forget that note later in the day. With more than 300 actions to choose from, you can automate just about every process on your device. 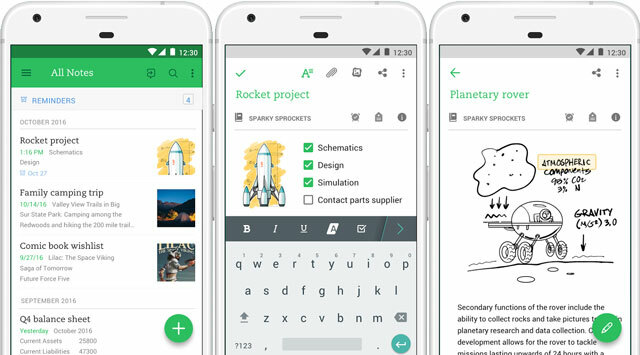 Evernote lets you go beyond traditional note-taking to clip web pages and images and add them to your note collections like a traditional journal. No more taking screenshots in order to save an image or webpage. Just import the image into Evernote, which even allows you to search for text inside images. The free version lets you sync your notes across two devices and upload 60MB of data per month. Share your notes with others, tag your notes for enhanced search functionality and set a passcode for extra security. 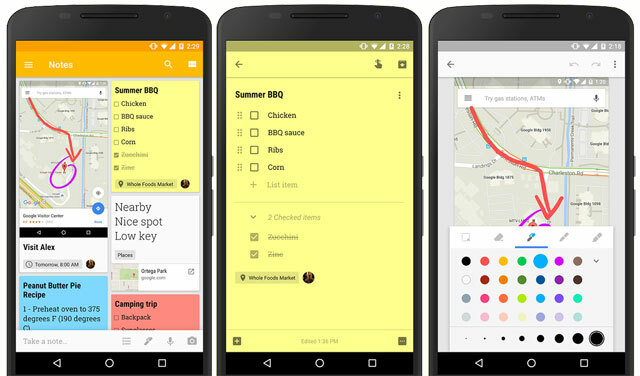 Google Keep is a virtual keepsake box for sticky notes, lists, photos and audio clippings. Each note can be flagged, archived, rearranged and more. Annotate images, rearrange checklist items and color code notes to organize all of your thoughts visually. Collaborate on special projects with friends, record a voice memo that’s automatically transcribed into a searchable note, or create a location-based reminder to pull up your grocery list when your phone recognizes you’re at the store. Paper By FiftyThree was named Apple’s iPad App of the Year in 2012, and the award was well deserved. 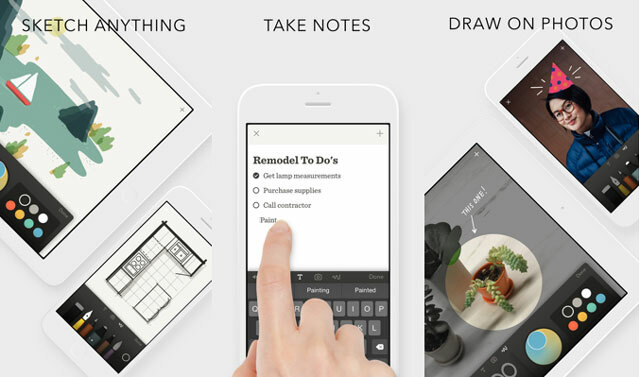 The app seamlessly handles note-taking and doodling in one beautifully designed platform. Think of it like a digital doodler where you can keep your text, photos and sketches together. When you’re ready to share your thoughts with the world, you can format them for PDF, Keynote or PowerPoint presentations. Enhance your Paper experience by purchasing Pencil, a stylus that uses surface pressure, an eraser function, a blender and more without making you change settings between functions. Any.do is a simple task list that uses timed and location-based reminders to keep you on task. 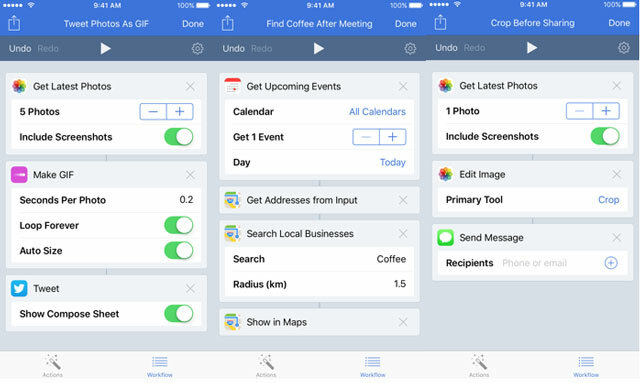 Share your lists with friends, assign tasks to colleagues, and sync with your calendar app to get things done faster. Use voice commands to capture a task or connect it to an AI assistant to complete the simplest tasks for you, such as scheduling a laundry pickup or sending flowers to loved ones. If you forgot to remind your spouse to pick up some milk at the grocery store, just add it to the shared shopping list, which syncs in real time. 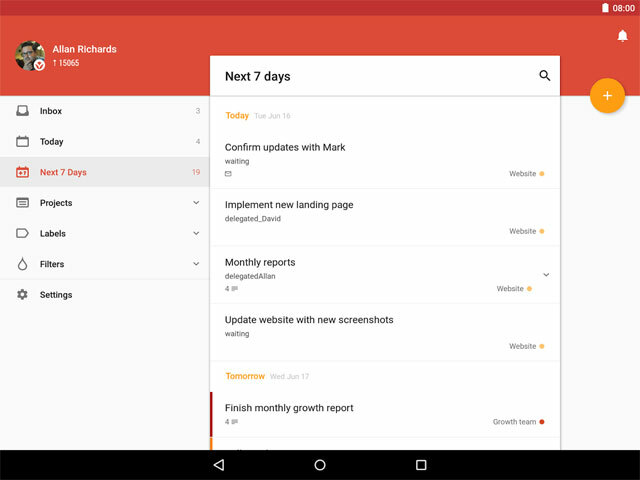 Todoist is another app with simplicity in mind. It differs from other platforms by offering more services within the free tiered platform. Create subtasks and subprojects for greater organization, collaborate on projects with other users, receive push alerts when the status of a task item changes and assign due dates and recurring dates. Todoist features color-coded priority levels. 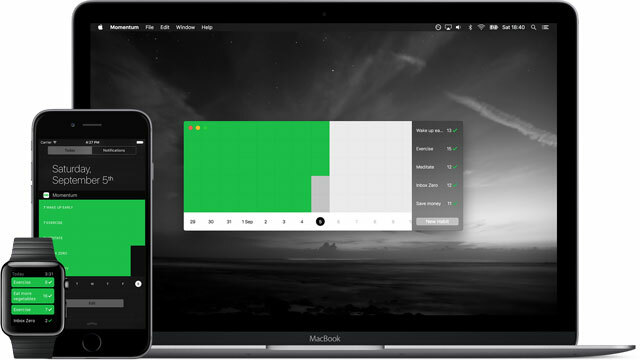 Track your productivity and achievement levels in handy little trend charts. Todoist also lets you use filters and label, though that requires a premium account ($28.99 per year). Other premium features include adding tasks via email, location-based notifications and productivity tracking and charts. Todoist can also be accessed via web extensions on Chrome, Firefox and Safari. Wunderlist is another strong contender in the to-do list category. Create folders, collaborate on lists, set reminders and due dates, receive push notifications and make notes to make sure all of your thoughts are captured. Add tags (hashtags) to your lists for better search functionality and print to-do lists with a single click. 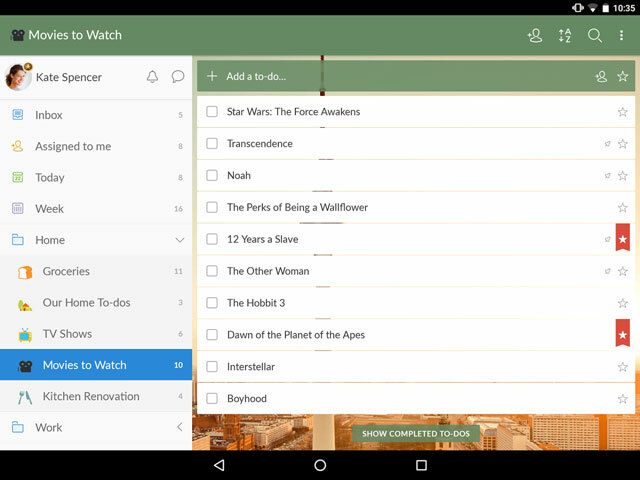 Wunderlist also works on the web with Chrome, Firefox, and Safari extensions. 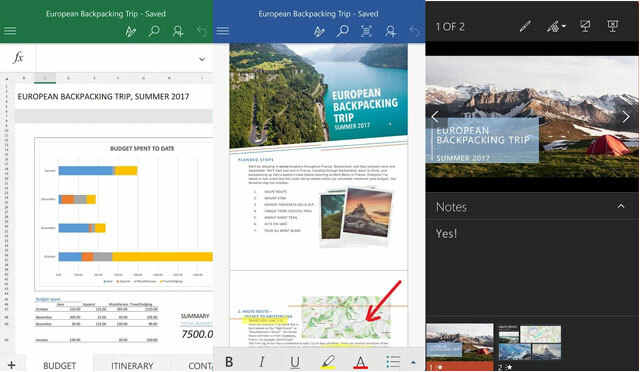 The Microsoft Office Suite you know and love offers an app version for Excel, PowerPoint, OneNote, Outlook and Word. Discover your inner smartphone power user and create and edit documents, answer emails and set auto-response messages like you would on your desktop. All of your information is stored in Microsoft’s cloud storage, OneDrive, so you can quickly access your documents across devices. To take full advantage of the suite, upgrade to premium features such as editing WordArt in Word, customizing PivotTables in Excel and creating fluid motions in PowerPoint. 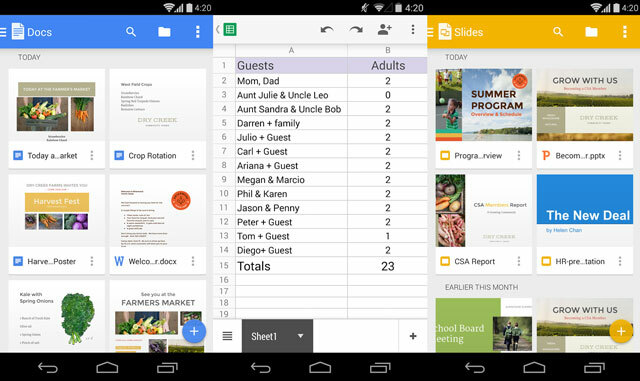 Google has a solid alternative to Microsoft Office Suite in Docs, Sheets and Slides, which compare to Word, Excel and PowerPoint, respectively. There’s also a form builder called Forms. 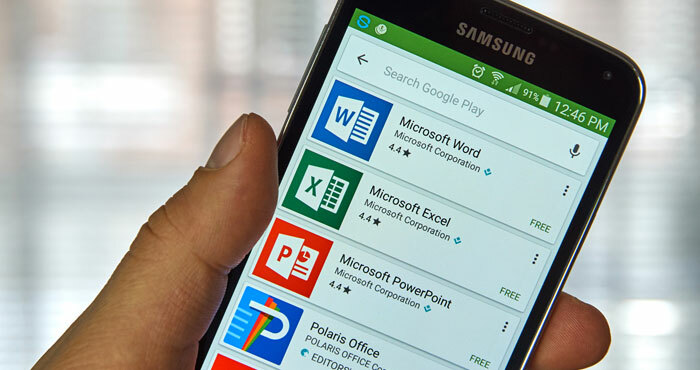 These apps (and the online services) are linked to the free cloud storage service Google Drive, and they’re all convertible with Microsoft Office documents. Google files automatically save as you type (Ctrl+S no more! ), and you can review revision histories to see which document collaborators had the most to say. To keep up with Microsoft’s beautifully designed templates, Google now boasts its own series of templates. Some are even compatible with label giant Avery, including the ability to label merge. Upload your new PDF or JPG to more than a dozen different services, including iCloud, Google Drive, Slack or Wunderlist. 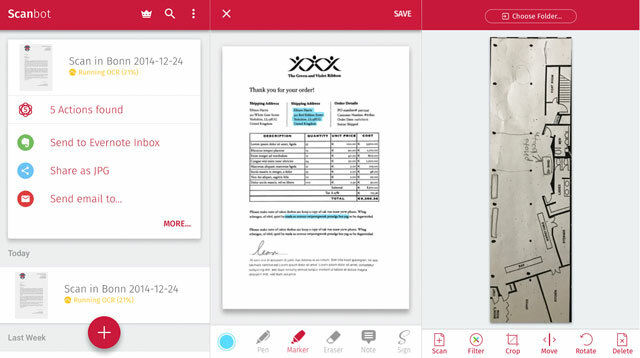 Scanbot’s premium features ($6.99 in-app purchase) support OCR text recognition, signatures and annotations. iOS users can virtually fax any scanned document to more than 50 supported countries. Need suggestions on where to store your documents? See Techlicious’ picks for The Best Cloud Storage Services. Dashlane was rated Techlicious’ Editor’s Pick for the best password manager. Dashlane not only saves your passwords but your credit card information as well, thanks to its digital wallet feature. There’s also an emergency access feature so you can share passwords with others for a preselected amount of time, or securely share a series of up to five notes and passwords with friends during routine use. Dashlane uses AES-256 encryption to keep your information safe and secure. For added security, create a master password to access all of your login credentials. Dashlane is Google Authenticator-compatible. If your accounts are compromised, Dashlane will alert you in real time and allow you to update your passwords for various sites right from the app. Note sure what to change your passwords to? Dashlane’s password generator will help you create strong ones. LastPass also performed well on Techlicious’ hunt for the best password manager. LastPass features AES-256 encryption and multifactor authentication, and it lets you set optional PINs and TouchID security measures. LastPass can generate passwords for you. Specify parameters such as length, capital letters and symbol requirements. To help you remember those complicated passwords, tell LastPass to make the password pronounceable. Keep all of your login credentials organized in your virtual vault by creating folders, and grant limited access to your password lists to family. LastPass will even save your credit card information and purchasing profiles so you can zip through digital shopping lines. So that you’re not left in password limbo while working on your desktop, LastPass also offers a web extension on Chrome, Firefox, Safari and Opera. Want advice on creating your own stronger passwords? See our story on The Best Password Managers. Gboard houses much of what you love about Google in one functional app. Type faster by gliding from one letter to another, and dictate your text on the go with voice typing. An integrated Google search bar in Gboard helps you get things done faster. Press the G to look up today’s news, find a nearby weather forecast, confirm movie showtimes and more. Need to add context to your message? No problem — use the GIF search to locate that oh-so-perfect animated image, or try the emoji search for various smiley faces. 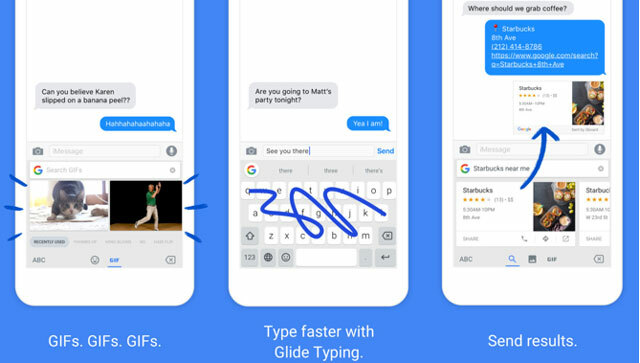 Some iPhone users grew weary of Gboard in the past due to its limitations, but an update in February means it’s worth taking another look. 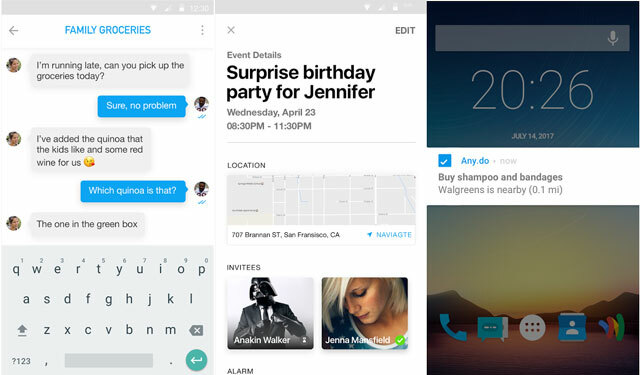 Voice typing, Google Doodles and enhanced emoji support are just a few of the updates. To date, Gboard supports more than 120 languages, so you seamlessly take advantage of multilingual typing and Google Translate while you type. SwiftKey’s catchphrase is an “autocorrect that actually works.” It’s a jab at Apple’s less-than-stellar autocorrect record and an effective one at that. While Apple is routinely working to improve its autocorrect feature by using users’ own vernacular for clues, SwiftKey has nearly perfected the routine of autocorrecting based on your personal writing style. For example, instead of changing “Howareyoutoday” to “hoarding,” it’ll actually insert the missed spaces for you, giving you “How are you today” as it was meant to be. 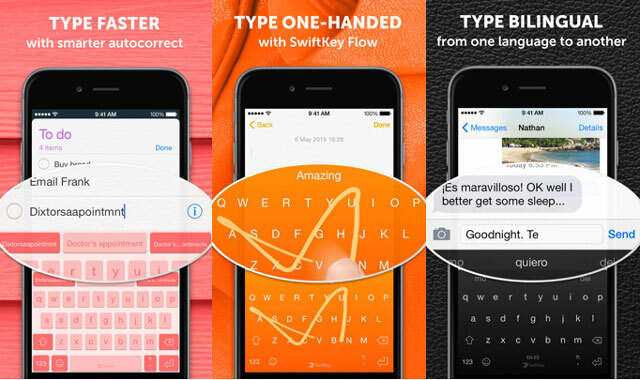 SwiftKey also features Flow, which lets users slide from letter to letter to form words or phrases. Always learning, SwiftKey predicts not only what word to use next, but it suggests an emoji as well. Still not convinced? SwiftKey features more than 30 language options, so you can text in dos languages all without switching your settings on your phone. Word Flow Keyboard, a Microsoft Garage project, makes it easier to text with one hand. The keyboard moves to the corner of your phone in an arc, so you can slide your thumb across the virtual tiles to communicate faster. As you type, Word Flow will suggest emojis, GIFs or images. If you mention someone in your contact list, it’ll pull up their information so you can quickly share their contact card. Need to send your best pal the address of a new brunch spot? Use the integrated search box to pull up the restaurant’s details. Pocket (formerly Read It Later) lets you save articles, images or videos from your web browser or compatible apps into the platform so you can access them later all without an internet connection. 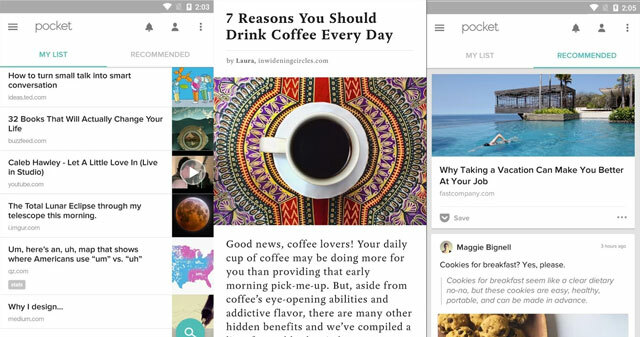 Pocket works with more than 1,500 apps, including Flipboard, Twitter and Zite. So whenever you’re in a rush and can’t finish that interesting article or that Tweetstorm, just clip it to access later when you have the time. Clip content using the web extension on Chrome, Firefox, Safari or Opera. 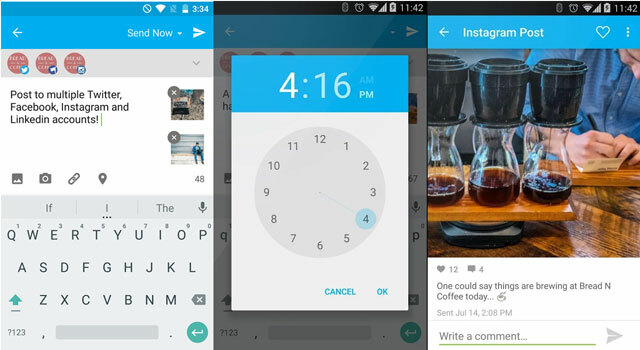 Instapaperworks similarly to Pocket. Clip important articles or videos and access them on the fly in a simple interface. 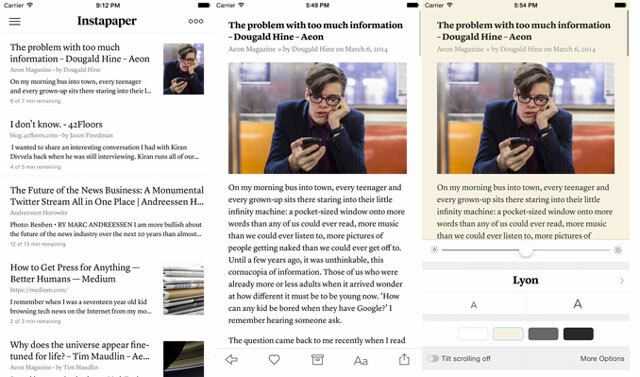 Instapaper works with hundreds of apps, including Digg, Flipboard and Twitter. Highlight important passages and share them with your friends across devices. What Pocket does for multimedia content, Instapaper does for pure reading. While Instapaper saves multimedia content, the app prefers to download a mostly-text version of each page to maximize your reading experience. Adjust fonts for a more comfortable interface. Momentum says “don’t break the chain.” It’s a simple idea behind productivity they say was coined by Jerry Seinfeld to keep people on task to creating better habits. The idea is that you continue a habit every day to make your chain longer, and the longer it becomes, the less likely you are to quit. Easy, right? To help users grow their chain, Momentum lets you set daily reminders to complete a habit, as well as set weekly targets. Export your data to track your progress offline, create notes to document your routine, and check off your habits directly from the Today screen without opening the app. If you’re going on vacation, pause your habits without breaking your chain’s progress. 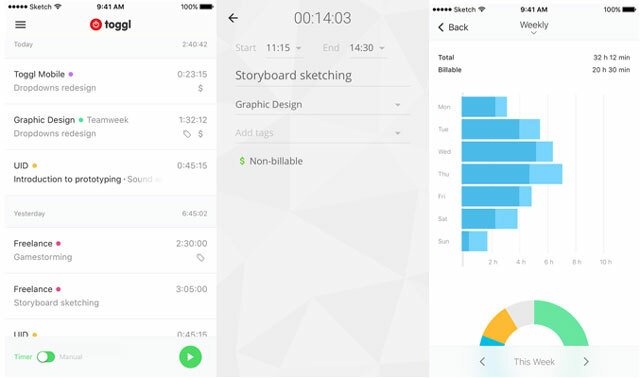 Toggl was created with freelancers in mind to help them track billable hours on the fly. Press Play, add a client name and a task descriptor, and you’re on your way to tracking your time spent per task. At the end of the week, run a report to see how your project times stack up. Even if you’re not an independent contractor, you can use Toggl to track personal projects, your children’s activities and more. Track time across devices by installing the desktop app or Chrome extension. Toggl integrates with project apps including Asana, Basecamp, Freshbooks, GitHub and Teamweek. 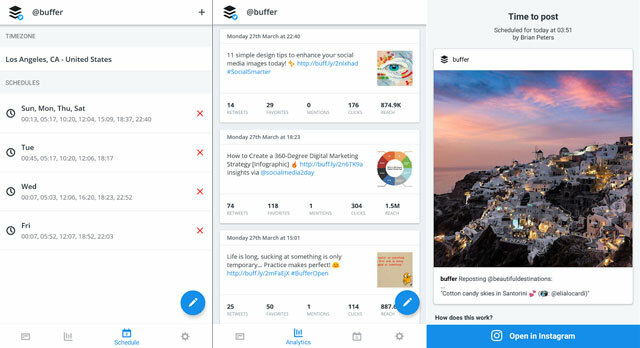 Buffer’s free version grants you one account per platform that lets you schedule up to 10 posts at a time. Supported platforms with a free account include Facebook, Google+, Instagram, Linkedin and Twitter. 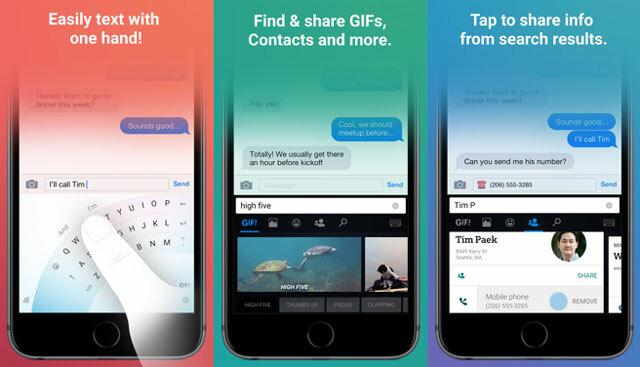 Images, GIFs and video uploads are all supported, and there’s a built-in link shortener. One of Buffer’s newest features called Pablo allows you to add typography to images to create those inspirational quote photos dominating Instagram today. Hootsuite offers tiered versions as well as a free version, which limits you to just three social media profiles. Supported social channels include Facebook, Google+, Instagram, LinkedIn, Twitter, WordPress and YouTube. Create short links, auto-schedule posts, upload images, video, and GIFs to your posts and more. To track how your profiles are performing, download Hootsuite analytics reports. Thanks for this wonderful toolkit! I’ve been looking for a reliable password manager and I’ve just found your article. I have to admit that this toolkit is impressive! I’ve tried some of these tools, like IFTTT, Any.do or Instapaper. I can highly recommend you TimeCamp for time tracking (found it at the beginning of this year, satisfied with the results), Trello for managing daily activities and Zapier for automation. Bill, I’m thrilled you found this article useful. IFTTT is one of my personal favorites to experiment with. I love baking, and the digital recipes are just another creative outlet for me—the bonus is the time savings! Not very good. Seems like this is a rush job site.